Digital Life/Digital Studies: From ‘Epistemic’ to ‘Vital’ Rupture? Current models of urban and ‘smart city’ development can be seen to pose a vital threat to citizens’ capacity for making life-building decisions, because the very algorithms that purport to make life easier risk stripping it of meaning. The RealSmS project aims to develop the ‘real smart city’ as a ‘de-proletarianising’ alternative to the resulting proliferation of urban dead zones, by exploring how communities might harness digital research tools to re-establish their vitality around citizens’ technologically enhanced collective intelligence. Both this diagnosis of the proletarianising effect of our urban ways of living and the exploration of potential cures are arrived at through the methodology of Digital Studies, an interdisciplinary approach to the study of what Nicholas Georgescu-Roegen termed ‘exosomatic’, or technologically constituted, organisms in their technological environments. The aim of this three-day doctoral training event is to immerse project participants in the discourse of Digital Studies, analysing our interrelations with technology from a variety of disciplinary standpoints, including the extended evolutionary synthesis, anthropology and psychology, as well as science and technology studies and – above all – critical theory. We shall pursue the question of how to situate the advent of digital technology more broadly within the field of technological culture and media studies. In the light of debates over the information revolution and fake news, can we speak of the digital as inaugurating a distinct ‘episteme’, marked by categorically new techniques of knowledge construction and corroboration? Does the digital transformation of society, emblematised in the emergence of AI, mean that epistemological rupture also coincides with a vital rupture, a profound change in the operation of life? In addition to these theoretical explorations, more practically, the workshop will prepare the way for RealSmS to publish a Digital Studies Toolkit, through which the DS methodology might be learned and reapplied to other forms of cultural analysis. ‘On the Meaning of Digital Studies’, plus discussion. Where might we look for a digital ‘episteme’? ‘Uncommon Ground’, panel 1 – ‘The Life of the Humanities’. Readings: Sara Baranzoni & Paolo Vignola (forthcoming) Bifurcate at the Root! Deconstructing Life, seminar led by Prof Francesco Vitale. Most participants will be housed in Collingwood College, up on the hill behind Durham University’s main Science Site. The Doctoral Training School will take place in the Law School, in the Palatine Centre, which is the big UFO-type building, built up against the main (Stockton) road. 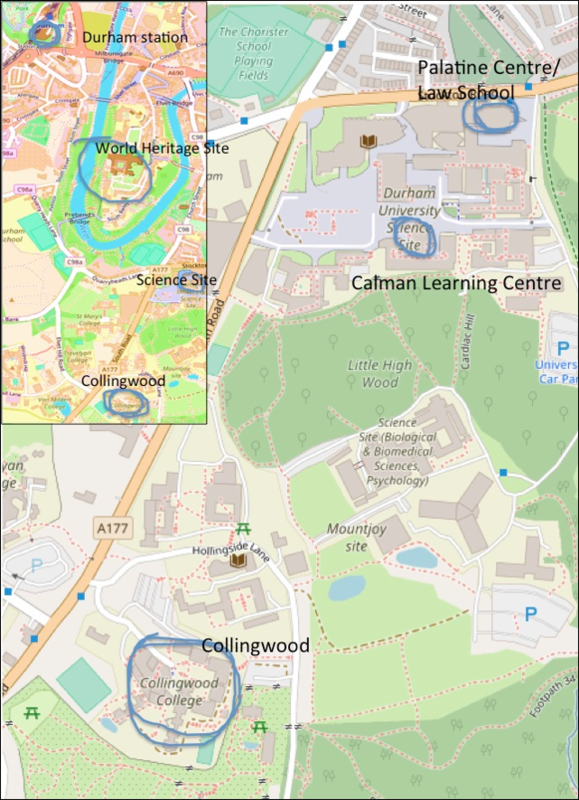 Two sessions will also be in the Calman Learning Centre, which is the round, modern building in the middle of the Science Site, about 50m away from the Palatine Centre. The Science Site is about 15 minutes’ walk from the cathedral, World Heritage Site, and town centre. For participants arriving at Newcastle Airport during the day, take the Metro from the airport to Newcastle Central Station. Most trains heading south from Newcastle will pass through Durham, so the service is frequent. You can identify appropriate trains on the large boards in the main station foyer, opposite which you will find ticket machines. The total cost of the journey from the airport to Durham will be about £12. From Durham station, it takes about 30 minutes to walk to the Science Site and 40 minutes to walk to Collingwood. Buses are infrequent, so it’s easier to take a taxi. Ensure you keep all your receipts so we can refund you. For participants arriving after long flights or later in the evening, we will be ordering Airport Express taxis to pick you up from Newcastle Airport. You will be contacted individually with details of your collection. The university will be invoiced directly for these taxis, but please do consider paying the Airport Express driver a (£3-5) tip. Breakfast will be provided in Collingwood, with coffee and croissants also available in the workshop. Lunch will also be provided. We will try to book a dinner from everyone on the Wednesday (details tbc), but you are otherwise left to your own devices in the evening. Again, please keep meal receipts. A couple of maps are provided below.